A new study released by SMU’s Geothermal Laboratory reveals that the U.S. has enough geothermal resources across the country to produce over three million megawatts of renewable power. The study, which was funded by Google.org, resulted in a comprehensive “Geothermal Map” of the United States, and concluded that geothermal energy surpassed the U.S.’s currently installed coal power by nearly ten-fold. To provide such a comprehensive analysis of the country’s geothermal resources, Principal Investigator Dr. David Blackwell incorporated rich data from tens-of-thousands of new thermal data points. Although the Blackwell had conducted a similar study back in 2004 with SMU, the current study incorporates far more data and better information of heat flow through the Earth’s crust. And just to give you some idea of the differences between the two studies, back in 2004, Blackwell had used only 5 heat flow points to inform geothermal estimates of West Virginia; the new study incorporates 1,455 BHT points in that same region. Furthermore, the new study is able to better predict potential geothermal energy sources by incorporating the latest advances in geothermal technology. For instance, recent drilling methods and newer technologies allow the development of geothermal resources at temperatures as low as 100˚C (212˚F) – regions originally deemed “unsuitable” for geothermal energy development. The latest temperature data and incorporation of in-depth geological analysis provided heat-flow maps at depths from 3.5 kilometers to 9.5 kilometers (11,500 to 31,000 feet). The recent update revealed that the Eastern United States may in fact be hotter than regions in the Western United Sates, thus making it ripe for geothermal development. However, the survey also incorporated more “practical limitations” on geothermal development as well. For instance, it ruled out development in urban areas or protected areas such as national parks. Areas that exhibit great potential for geothermal development include the Appalachian trend, heated aquifers in South Dakota, Northern Illinois, and the Gulf Coast. So what can we take away from the latest goethermal map of the United States? In particular, the latest research shows that geothermal is much more viable than previously thought. The fact that it can potentially provide ten times more power than currently installed coal capacity reveals that it can provide enormous amounts of clean power well into the future. 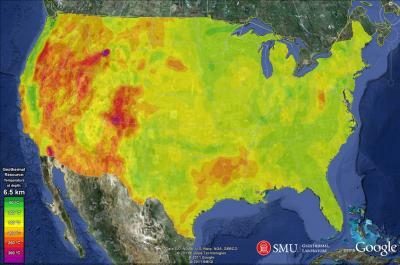 Do you think the latest SMU research will encourage further Geothermal development in the United States? Will geothermal be a strong component of future clean energy production both in the US and around the world? It’s a cool (ahem) study, but just looking at the map, most of the juice is not where most of the population is, and geothermal doesn’t travel well. After all, who wants cooling towers all over the supervolcano under Yellowstone National Park? So I suggest we consider artificial geothermal, where we make hot molten material closer to where we need it, and then make steam for electricity and/or district heating out of that. These designs have inherent safety advantages: (a) the coolant won’t boil off, because the boiling point is above 1650 C instead of 100 C; (b) the units sit underground and (for S/STAR and Hyperion) rely on the natural convection of molten lead, so there are no pumps to fail; (c) there’s no pressurization, again eliminating a failure mechanism; (d) the reactor is essentially in the bottom of a well full of liquid lead, so it doesn’t have anywhere to melt “down” to. In the event of a core failure, the decay heat would be carried off by natural convection of the lead. Also, the volatile fission products like Cs-137 are soluble in molten lead, so they don’t escape as easily. Just like geothermal, the outlet temperature is relatively low, so it’s not terribly efficient for electricity generation but quite good for CHP (combined heat and power). What about radioactive waste, is that still an issue? Is the use of molten lead problematic? Hasn’t the use of lead been on the decline since it was discovered how toxic it is? How many small modular nuclear reactors using liquid lead are we talking about: hundreds, thousands? Why use this process in areas where natural geothermal could be used instead? The map also ruled out development in urban areas and protected areas such as national parks, so areas like Yellowstone would definitely be out. You seem to be dismissing the idea that geothermal could be used in a much wider areas than previously thought. What I take issue with the concluding paragraphs which suggest geothermal can replace coal. While a 100 C source would work pretty well for district heating, the thermal efficiency of electricity generation depends on the temperature difference, so low-grade geothermal would be terribly inefficient at making electricity. Most coal in the US is burned for electricity. Most building heat comes from oil or gas. So while I do think geothermal could replace a lot of fossil fuel use for building heat, I don’t quite buy it as displacing coal. The use of lead is actually on the increase; every hyrid car on the road has a lot more of it than a conventional starter-motor battery. The electric storage in hybrid vehicles is still plain ol’ lead-acid batteries. Nothing beats it yet for the combination of cost, energy density and lifetime. Lead is certainly toxic if you ingest it, but these are closed-cycle systems. The lead is recycled when the reactor is returned to the factory for refueling. (A) the volume of waste is very small compared to the waste (if you count CO2) from burning fossil fuel. For the Hyperion reactor, imagine trading off radwaste the size of a basketball for a million tons of carbon over ten years, for example. (B) the waste is solid, not gas. Makes storing it a lot easier. A “vitrification” process has been developed to encapsulate high-level waste in a glassy form which is very resistant to attack by water, which is the main route everyone worries about for the radioisotopes to get out of confinement. (C) The required confinement time for radwaste is not determined by its radiotoxicity. It is determined by our understanding of cancer development. We no longer walk down the streets flagellating ourselves to propitiate an angry deity and ward off the Black Death, because we understand infectious disease now. Similarly, in one or two hundred years, I expect we will understand the fundamental mechanism of carcinogenesis and will have developed ways of inhibiting that process. Sorry, I tried to reply to you, but somehow it got treated as a new post. Please see my response above. Mr Johnston, You are correct of course. Geo is more useable than suggested by others. On another arm of this topic, energy, Bill Gates has a good talk on TED TALKS in which he says he is backing people developing processes to use the spent fuel rods in a new process for nuclear power. He called it a traveling wave concept that ends up consuming over 98% of each fuel rod, vs about 1 or 2% in today’s primary processes in the USA. Thus, the spent fuel situation is virtually eliminated. Much effort is also going into light reactors using Thorium which is among the more prevalent minerals on earth. Thorium reactors were developed about 1957 but the program was dropped because Government wanted nuclear products that could be used for weapons and the thorium was very benign, safe and did not produce U-235 orf Plutonium. There is a lot more work going on so that we can have an All of the Above approach. None solves everything but we must not stop. People are also working on systems that more easily extract Hydrogen from water. Current processes expend more energy than is extracted and so, not practical. But, in reducing the bonding energy that we see as surface tension, we also allow more rapid, lower powered methods for extracting Hydrogen. And there is so much more. There are some very innovative methods being tried to use geo thermal for many purposed from heat to electricity to extracting drinking water from the oceans to providing Hydrogen, etc. You are right, let’s be positive about geo and other combined efforts. I do agree that an “all of the above” approach is needed. I feel that solar technology will become a big part of the answer over coming years, and inexpensive at that. But I think we need the approach of “letting a thousand flowers bloom” in order to find what the best clean energy solutions are. There might be quite a few, all working together. There are always surprises along the way with innovation. The development of the internet certainly held surprises, and has become more powerful and disruptive than many people thought. I think renewable energy development, coupled with a new distributed energy grid (let’s call in the Enernet), will be like this too.